LCA (Life Cycle Assessment) to determine the environmental impact of products, for which there is no legislative compulsion - yet. the input flows from resources and output flows to the environment required by the manufacturing process. The manufacturer of a product can run a computer application which navigates back down the supply chain processing the computer interpretable information published by each tier of supplier. the automated generation of an RDF vocabulary from existing ISO TC184/SC4 information models will not give a useable vocabulary. If these points are accepted, then the next step is the extraction by hand of an RDF vocabulary from ISO TC184/SC4 and ISO TC207/SC5 standards which supports the REACH and LCA data requirements. RDF (Resource Description Framework) is a way of representing statements and publishing them on the Web. it has an operating voltage of 230 volts. The RDF diagram for these statements is shown in Figure 1. RDF has representations as XML or as N3. N3 is much more readable, and is supported by software such as the Tabulator plug-in for Firefox. vocab:operatingVoltage   [ vocab:volt 230 ] . 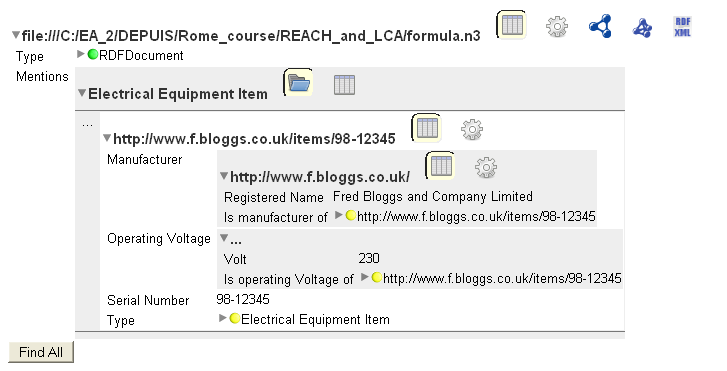 vocab:registeredName     "Fred Bloggs and Company Limited" . In this example, "vocab" is a reference to a formal vocabulary which is published somewhere on the Web, which makes the statements computer interpretable and semantically precise. A set of RDF statements is called a "formula". Objects can be identified on the Web by URIs. NOTE 1 A URI can but need not identify computer file. A URI can identify a real world object such as the Eiffel Tower, a person, an organisation, or a type of object provided by a supplier. If a URI is an HTTP URI, then it can be dereferenced - i.e. accessed over the Web using HTTP. Deferencing obtains a representation of the object. NOTE 2 If a URI identifies a computer file, then it is reasonable that dereferencing should obtain the file. (This is not always what happens because the owner of the file may want you to identify yourself, or pay, first.). If a URI identifies something else, then only a representation can be obtained. You cannot download the Eiffel Tower to your computer because it is 2000 tonnnes of steel. Often the representation of the object is an HTML file, which can be displayed to a person on a browser. The HTML file may contain links to other objects, which can be dereferenced in turn to obtain other HTML files. This is the basis of Web 1.0. Dereferencing can obtain an RDF formula. The way in which a client can choose the form of the representation is explained in Cool URIs for the Semantic Web. An RDF formula contains statements which mention the URIs of objects. These URIs can be dereferenced to get other formulae. The navigation from semantically precise formula to semantically precise formula is the basis of Web 3.0. The computer interpretable formula can be processed by an application using a query language such as SPARQL. It can also be displayed by an RDF browser. EXAMPLE 2 The Tabulator plug-in for Firefox displays the RDF example as shown in Figure 2.
the person who wants the data navigates the Semantic Web to get what he or she actually wants. the person who sends the data gathers together into a "lump" all the data that he or she things the receiver wants. In the data push scenario, data models are crucial because they can be an agreement about what is exchanged. In the data pull scenario, data models are less important because the information is distributed in many different formulae. It is up to the user to check that he or she has obtained all the necessary information. A data model can be a criterion for completeness can consistency against which the published information is checked. The same published information can be checked against different information models for different purposes. Neither formula complies with a data model which requires that "the registered name shall be specified for the manufacturer of an equipment item", but the information gathered from the two does. EXAMPLE 2 A producer of a product may publish information about the product on the Web. The information could include the product structure, a materials breakdown to support REACH compliance, and LCA information about manufacturing, use and disposal activities. A user of the product can retrieve the information of interest, and ignore the rest. Perhaps the LCA information complies with ISO/TS 14048, and perhaps the product structure information complies with a conformance class of ISO 10303-214. Maybe not, it is up to the user to check. NOTE 1 The terms "data model" and "information model" are regarded as synonyms within this document. no information which is irrelevant to the activity is recorded. NOTE 2 The strong link between data models and activities is the reason for the inclusion of an activity model within each ISO 10303 Application Protocol. EXAMPLE 1 A conformance class of AP 203 ensures that all the information necessary to define a shape is present. A conformance class excludes information which cannot be processed. Hence if a CAD system can process a boundary representation but not CSG, then a conformance class is chosen which excludes CSG. The EXPRESS shown in Figure 3 is not a data model. NOTE 3 In the early days of ISO 10303 development, it was suggested that all the attributes in the resource models should be optional, and that they should only be made mandatory by constraints in Application Protocols. This was not followed, probably because this approach is less valid for geometry and topology where many applications require the same constraints. The ISO 10303 schemas are clearly data models. The ISO 15926-2 schema looks very different, and does not constrain the data that shall be contained within a conformant "lump". The role played by the different sort of data model in ISO 15926-2 is discussed in section 5. The parties can choose a data model, often one that is an international standard, as the basis of the agreement. Compliance with the agreement can be validated by software tools. A software designer can implement input from, and export to, a "lump" which is in accordance with a data model. The link between data models and activities makes this possible. It is also the weakness of traditional data models, because there are many activities with different information requirements - so there are many different information models. NOTE ISO 10303 has created an architecture which builds different data models to support different activities from common components. This has been largely successful, but at the cost of awesome complexity. This complexity has the potential to crush the entire ISO 10303 project. Some constraints on the completeness and consistency of data are common to all ISO 10303 APs. If these constraints are incompatible with an activity, then using ISO 10303 is a problem. a product shall have exactly one product_context. ignore ISO 10303-41 and use some other standard. Organisations have opted for (2) or (3) according to whether the other parts of ISO 10303 are of sufficient value. 5 Is ISO 15926-2 a data model? it is a particular upper ontology, which constraints the vocabulary that is used. classes or properties which are specialisations of those defined in ISO 15926-2. Just looking at a set of RDF statements, it is not possible to tell whether a they comply with ISO 15026-2. They comply if the relationship with ISO 15926-2 has been recorded by a file which specifies the relationship. This file can be published on the Web as quality metadata about the vocabulary. The property vocab:manufacturer does not fit into ISO 15026-2 except as a class_of_class_of_relationship. Hence it is probably best to regard this as outside the ISO 15926-2 quality validation. A formal use of ISO 15926-2 for this purpose would record a manufacturing activity, for which the organisation has the role of performer, and the equipment item has the role of output. NOTE 1 In the EU funded CASCADE project, the vocabulary for LCA defined in ISO/TS 14048 was expressed as RDF, and mapped to ISO 15926-2. This may be of little interest to most users of the RDF vocabulary for LCA, but it is not an implementation overhead. For some users, the mapping to ISO 15926-2 gives useful additional information about the precise semantics of the vocabulary. A business process can insist that only vocabularies with a documented relationship with ISO 15926-2 are used. This mapping may ensure a level of quality within the vocabulary. The information is not published as a single "lump". Instead the information is spread between different formulae published on the Web. Each component in an assembly may have a URI, and the information about that component is contained in a formula obtained by dereferencing the URI. All ISO 10303 APs required an approach to the activity of managing product data which may not be appropriate. This approach is defined in the PDM kernal within ISO 10303-41. It is not essential to adopt this approach in order to comply with REACH and LCA requirements. inputs to and outputs from manufacturing activities. Many of the concepts necessary for this vocabulary already exist within ISO TC84/SC4 standards, but they are locked away within data models which impose constraints. Analyse ISO TC184/SC4 data models - ISO 10303, ISO 13584, ISO 15926, and perhaps also ISO 15531 - to extract the concepts necessary to record information about product properties, product decomposition and inputs and outputs for manufacturing activities. These concepts form a core vocabulary, which should have sensible (not idiosyncratic) names. it can be imported or exported by software which is already AP compliant. it can be imported or exported by software which is already ISO/TS 14048 compliant. Define the relationship between the elements of the core vocabulary and the upper ontology in ISO 15926-2. This will be a validation of the consistency of the vocabulary, and will enable the vocabulary to be used by ISO 15926-2 compliant software. the European Platform on LCA, within EU DG JRC, Institute for Environment and Sustainability. This activity also fits within the proposal to ISO TC184/SC4 for "Standardisation for Environmental Evaluation of Manufacturing Systems", from MSTC (Manufacturing Science and Technology Center), Japan, presented by Professor Fumihiko Kimura.